The Monastery of the Great Lavra, (Greek: Μεγίστη Λαύρα, Megísti Lávra) is located on the Athos Peninsula in northern Greece. The Great Lavra was founded in 963 by St. Athanasius the Athonite. It is ranked first in the hierarchical order of the Mount Athos monasteries located on the peninsula. It is considered the mother monastery of Mount Athos. The Great Lavra was the earliest of the monasteries built on the Athos Peninsula. It was built by St. Athanasius with the financial support of the emperors in Constantinople including Nikephorus Phocas, Romonos II, and Ioannis Tzimikes. St. Athanasius is considered to be the founder of athonite monasticism. The monastery is built in the form of a small medieval town within a strong walled fortress with fifteen towers. There are 37 chapels associated with the Lavra. These are located both within and without the fortress walls. The central church within the Lavra, the Katholikon, was among the first structures built starting in 963. It is a domed four-column church that was modified over time to a more cruciform shape. The church was initially dedicated to the Annunciation of the Blessed Virgin Mary, but was re-dedicated to St. Athanasius in the 15th century. His tomb is located in the chapel of the Forty Martyrs which is located next to the narthex of the Katholikon. The monastery is one of the richest on Mount Athos and houses considerable quantities of ecclesiastical plates, sacerdotal vestments, and relics of numerous saints. 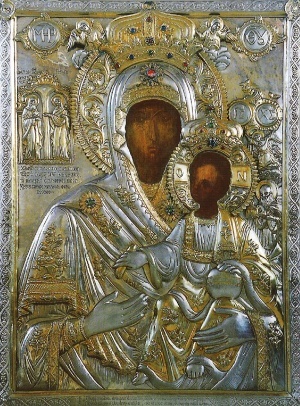 The Lavra also has the crown and sakkos of emperor Nikephorus Phocas. The Lavra contains a library of some 2,046 manuscripts; 165 codices; and 30,000 printed books. This page was last edited on November 11, 2009, at 16:13. This page has been accessed 38,470 times.